Again I want to share this useful cable that I recently used. I thought it will be that pricey, but I bought this for just P30.00 at CD-R king. While doing something on the net, I find it hard to upload some documents, there's two options (choose) and (submit) but when I tried to hit choose, it's not doing anything, so tried to do it on my phone, log in to the site, and did hit again choose and it went through, it gives me an idea that I can do the whole process using my android phone instead of using my laptop. Having that thought, I already choose the file that I need to upload, but suddenly the site instructed me to crop the picture, when I tried to toggle to crop the picture, it will not allow me to move any direction, I can't crop the picture! Oh no! 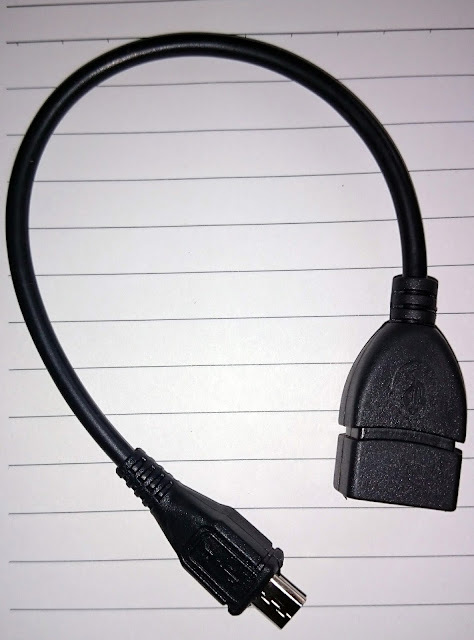 another dilemma, so that's how OTG (On-The-Go) cable came in, I bought one and then connect the other cord to my charger port, and connect the other end to my mouse, and there you go I was able to edit it! it was successful thanks to this OTG cable. What does this OTG cable can do? 01. Connect your USB on your phone to transfer files directly to your phone or vice versa. 03. Connect your keyboard to your android phone. Maybe there's more but as of the moment this are the things I used OTG cable for. Hopefully this can help in any means.